Bournemouth manager Eddie Howe says his side fully deserve to end the season as second-tier champions. His side won the Championship title on a dramatic final day of the season. Watford's draw against Sheffield Wednesday and Bournemouth's 3-0 win over Charlton saw the Cherries claim top spot and confirm promotion. "I do think we deserve it," said Howe. "In my opinion we have been the best team this season and led the division for the longest time." He continued: "It's fitting reward for the players - once again they were magnificent. We've consistently been the best team. "I'm delighted the players can call themselves champions and we leave here on a real high and it's fully justified." Watford led the league by a point going into Saturday's final round of fixtures but Atdhe Nuhiu's late equaliser denied them three points and the Cherries took advantage at The Valley. With promotion all but sealed heading into the game, two goals from Matt Ritchie and one for Harry Arter earned the victory that earned the title. "It's a fantastic feeling and not something we expected turning up here today," added Howe. "We wanted to do our job and be professional and take care of things. "We were hopeful of a favour from Sheffield Wednesday and I did feel that was going to be a difficult game for Watford. When we played them very recently they never gave up that day. We are thankful for that bit of help." 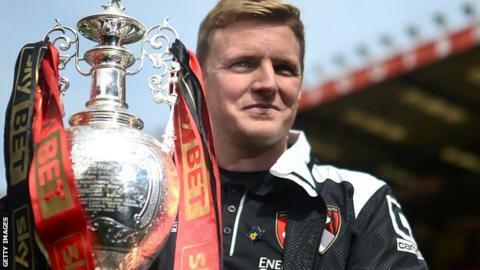 Howe's side will now celebrate their historic promotion, and contemplate a first season in the top flight of English football, with a bus parade on Monday. Bournemouth's 37-year-old manager will then turn his focus to next season's Premier League campaign, and he says the majority of his side will be given a chance to prove themselves in the top flight next term. "You can see from my track record with these guys that the guys that have performed so well will get an opportunity to perform," he said. "I don't believe in wholesale changes in the close season. I don't believe in not giving the players a chance to show whether they are good enough. "Ultimately they have to take that opportunity. We stuck with the majority of the squad from League One to the Championship. There will be subtle changes, there will be players coming in, there will be players leaving, but the core group will remain the same."